Adrian Newey OBE has conquered Formula One like no other man. The legendary designer’s cars have won more races and more championships than anyone in the history of the sport and have seen him described as being “close to genius”. He certainly has a legitimate claim on the title of ‘Britain’s greatest living engineer’ for the sheer depth of his success in the most technologically advanced sport in the world. Within months of graduating from Southampton University with a first class honours degree in Aeronautics and Astronautics, he was working in Formula One at the Fittipaldi F1 team, however, his first taste of success came in the US where his ‘March’ sports car designs won the most prestigious event in America, the Indy 500, for three consecutive years (1985/86/87). Following a brief venture with March in F1, Newey was lured to the Williams team, where in partnership with Patrick Head, he brought home five Constructors’ titles between 1992 and 1997 and made champions of Nigel Mansell, Damon Hill and Jacques Villeneuve, while adding a fourth title to Alain Prost’s list of achievements. When Newey departed Williams for fresh challenges at McLaren, he confirmed his prowess with three further championships, rounding off the decade with the 1998 Constructors’ Title and two Drivers’ Crowns for Mika Häkkinen. Having taken both Williams and McLaren to the heady heights of multiple titles wins in the 1990s, Newey faced a fresh challenge when he joined Red Bull Racing. The end-goals were the same – but this time Adrian wasn’t joining a venerable F1 institution with a cabinet full of silverware. Instead, he was joining a young outfit starting on its journey, with a chance to influence its development from the ground-up. It didn’t take him long to deliver. Newey’s revolutionary RB5 took the team to its first victory when Sebastian Vettel took the chequered flag at the 2009 Chinese GP. The RB5 claimed another five victories during the season and ultimately finished second in the Constructors’ Championship. The next season saw the team go one better. Nine wins for the RB6 saw Red Bull Racing claim its first Constructors’ Championship, while Vettel also collected the Drivers’ title. 2011 was a year of utter dominance for Red Bull who notched up 18 poles, 12 victories, 15 other podium finishes, ten fastest laps and both titles. The 2012 season got off to a slow start, but as the RB8 came on song, it propelled Sebastien Vettel and the team toward their third titles. The following year’s design was a real world-beater. Smashing records everywhere the car, in the hands of Sebastien Vettel, dominated once again providing an amazing fourth crown for the German and yet another landslide triumph for Newey. 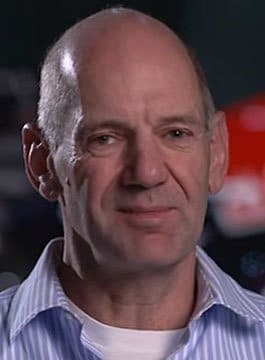 Adrian Newey’s determination extends beyond his drawing board (he still uses one) and in his spare time he’s an enthusiastic amateur racer; perhaps a predictable pastime for a fiercely competitive soul for whom second-best is never acceptable. It’s a quality he has taken to every post he has held in a long and impressive career. In 2014, Adrian achieved his 150th Grand Prix victory before announcing his decision to step back from Formula One to take on fresh challenges and work on new technology projects. In January 2015 it was confirmed that F1’s most eminent designer would join forces with the most successful sailor in Olympic history, Ben Ainsley, in a bid to win the America’s Cup. He is also bringing his design expertise to a revolutionary new supercar project. Adrian Newey has now teamed up with ITV motorsport presenter, and experienced event, host Louise Goodman to offer audiences an insightful and entertaining vision into the innovation, technology, teamwork, leadership and above all, success, that has been the hallmark of his career.